For probably the large majority of basketball fans today, Dirk Nowitzki and Dwyane Wade are two of the greatest legends to ever grace the NBA. 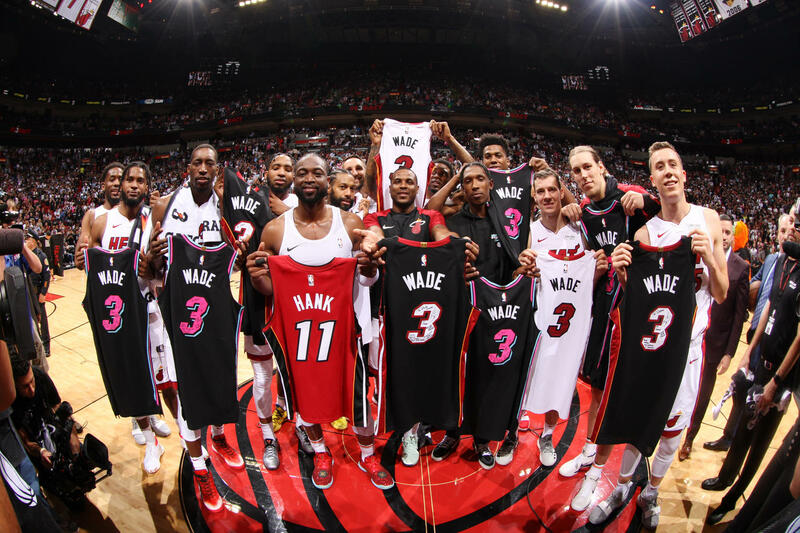 Earlier they played the final home games of their storied careers and went out with signature performances that took fans the world over back down memory lane. Wade and Dirk each poured in 30 points, turning back the clock one last time for cities that absolutely adore them. Wade froze the 76ers all night with the same footwork and guile that have tormented opposing defenses for 16 years. He was dropping in threes and fade aways, and slithered around the court with that special agility he’s always had. He even jumped on the scorer’s table one last time and reminded the world that ‘this is his house’, although he probably pictured it going more like this than like this (see 2:30 onwards). Father Prime might have won this one, D-Wade. Nowitzki’s sign off to Dallas gave us a chance to say goodbye to one of the most special offensive abilities of any big man in the history of the game. Scoring the first 10 points for the Mavs got the arena bouncing early, and at no point did they seem to be louder than when DIRK GOT UP TO ROCK THE RIM in the 3rd quarter (see 2:20 in the video above). But through all the celebrations, Dirk’s goose-neck follow-through stood tallest in that sea of limbs in Dallas, and the split-second swish of the nets from his rainbow jumper rang louder than that raucous crowd, just as it always has. Their tributes hit home, too. Wade’s season-long tour of exchanging jerseys with great contemporaries and future stars culminated with this powerful Budweiser commercial, capturing the impact of his greatness as a basketball player and his work for the community. Nowitzki’s, on the other hand, spoke to his status as arguably the greatest or most important international player basketball has ever had. Legends like Charles Barkley, Scottie Pippen, and Larry Bird each paid tribute to #41, and heir apparent Luka Doncic brought out special kicks for the occasion. Both will play their final games tomorrow, Wade against the Nets and Nowitzki against the Spurs. With both of them missing out on playoff spots, basketball will have to say goodbye. Ah, the Lakers. What a wild ride it’s been. It was only last summer that their newly minted front office duo of Magic Johnson and GM Rob Pelinka was lined up to power the Lakers back into championship contention. A fast start made us all feel like the Lakers were well and truly THE Lakers again, but eventually injuries stifled their rhythm and the spotlight and the endless questions and rumors that come with life with LeBron crippled their team chemistry. With that went a playoff spot and, potentially, the luster to attract other stars. Magic stressed, however, that he believes the Lakers are headed in the right direction, but his sudden departure may have just buried the Lakers and their future in more questions than they already were. Two days ago, the NBA released a slate of potential playoff scenarios. With one game to go for nearly all the teams in the Association, the Playoff picture is as good as set. Out West, only the 7th and 8th seeds are left in contention between the Spurs and the Clippers, while the 9th-seeded Hornets will contest the final berth in the East currently held by the Pistons. This year’s dance won’t be short of narratives. Giannis will want to cement his superstar status after an MVP-level campaign by leading the league-best Bucks to a trip to the Finals. Though they’re overwhelming favorites in the first round, the East is top-heavy enough to test if they’re the real deal. Toronto, Philadelphia, and a struggling Celtics team all boast stacked rosters hungry to establish themselves as top dogs, while D’Lo and the Nets and an upstart Magic team make their long-awaited returns from futility to postseason ball. In the West, questions about championship fatigue have plagued Golden State all season, but with Boogie in the swing of things and their best players all healthy they still have to be favorites to play into June. Houston and OKC is looking like a dynamite matchup between MVP candidates James Harden and Paul George, while the Nuggets are probably the biggest unknown quantity in the conference. Playoff basketball is right on the horizon. Let the madness begin.